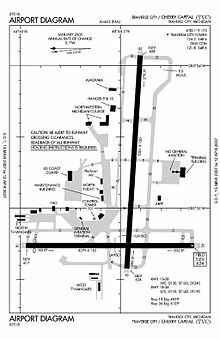 Cherry Capital Airport (IATA: TVC, ICAO: KTVC, FAA LID: TVC) is a public use airport located two nautical miles (2.3 mi; 3.7 km) southeast of the central business district of Traverse City, in Grand Traverse County, Michigan, United States. It is owned by Grand Traverse and Leelanau counties. It is included in the Federal Aviation Administration (FAA) National Plan of Integrated Airport Systems for 2017–2021, in which it is categorized as a non-hub primary commercial service facility. Cherry Capital Airport had 190,286 passenger boardings (enplanements) in calendar year 2013, an increase from 182,616 enplanements in 2012 and 167,488 in 2010. The airport had 429,364 passengers travel in and out in the 2015 calendar year. Cherry Capital Airport was opened in 1969 as Cherry County Airport, replacing Ransom Field. The airport was moved onto the Coast Guard Air Station which had opened in 1946. The airport opened with 4 runways, all but one of which have been replaced. Remnants of the former runways exist to this day, with some being left abandoned and privately owned. In the fall of 2004, Cherry Capital opened a new terminal on the south side of the east-west runway, demolishing the old one on the north side. This project also reconfiguring the runways, removing the third diagonal runway. Since then, Cherry Capital Airport has continued to grow with various carriers adding seasonal service and destinations. Cherry Capital Airport was the recipient of the 2003–04, 2004–05, and 2005–06 Balchen/Post Awards for outstanding achievement in snow and ice control in the small commercial service airport category. Soon,[when?] the airport will implement the first biometric access systems in the country. The airport is the ninth to implement the advanced security measures suggested after the September 11, 2001, attacks. This terminal is able to comply better with security regulations and supports a greater number of flights and passengers. In 2013 and 2017, the airport extended the east-west runway of the airport to the east and west respectively to accommodate more flights to more locations, possibly to upgrade to an international airport for Air Canada Express flights. In October 2017, a Costco store opened next to the airport entrance, on a property leased to the warehouse chain for 60 years. The Airport has one concourse with six gates. Cherry Capital Airport covers an area of 1,026 acres (415 ha) at an elevation of 624 feet (190 m) above mean sea level. It has two asphalt paved runways: 10/28 is 6,901 by 150 feet (2,103 x 46 m) and 18/36 is 5,378 by 150 feet (1,639 x 46 m). For the 12-month period ending December 31, 2017, the airport had 84,834 aircraft operations , an average of 232 per day: 73% general aviation, 11% scheduled commercial, 7% military, and 9% air taxi. At that time, there were 107 aircraft based at this airport: 80 single-engine, 17 multi-engine, 4 jet and 6 helicopter. In February 2009, Forbes magazine ranked Cherry Capital Airport second in their list of the top ten "rip-off" airports in the United States, citing an average cost per mile to travelers departing TVC of 41 cents. The airport has one Fixed-Based Operator (FBO) AvFlight. FedEx Feeder is operated at the field by CSA Air. UPS flights are operated by Freight Runners Express and AmeriFlight. Northwest Airlink Flight 4712 (operated by Pinnacle Airlines) was a Bombardier CRJ200 from Minneapolis-St. Paul "which overran the runway while landing at TVC during a snowstorm on April 12, 2007. The aircraft received substantial damage, but the 52 people on board were not injured. The Board determined that the probable cause of this accident was the pilots' decision to land at TVC without performing a landing distance assessment, which was required by company policy. This poor decision-making likely reflected the effects of fatigue produced by a long, demanding duty day, and, for the captain, the duties associated with check airman functions. Contributing to the accident were 1) the Federal Aviation Administration pilot flight and duty time regulations that permitted the pilots' long, demanding duty day and 2) the TVC operations supervisor's use of ambiguous and unspecific radio phraseology in providing runway braking information. Four safety recommendations were issued to the FAA addressing timely post accident drug testing, training on landing distance assessment performance, ground operations personnel communications, and criteria for runway closures in snow and ice conditions. The NTSB adopted the report on June 10, 2008." ^ a b c d FAA Airport Master Record for TVC (Form 5010 PDF). Federal Aviation Administration. effective November 10, 2016. ^ a b "Measures of Michigan Air Carrier Demand". Michigan Department of Transportation. Archived from the original on January 29, 2013. Retrieved January 24, 2014. ^ "Timeline". Traverse Area Historical Society. August 4, 2016. Retrieved March 2, 2018. ^ a b c "New State-of-the-Art Terminal". Cherry Capital Airport. Archived from the original on September 28, 2007. ^ Northeast Chapter (May 12, 2004). "2003–2004 Balchen/Post Awards". American Association of Airport Executives. Archived from the original on September 24, 2010. Retrieved June 6, 2011. ^ Northeast Chapter (April 27, 2005). "2004–2005 Balchen/Post Awards". American Association of Airport Executives. Archived from the original on September 24, 2010. Retrieved June 6, 2011. ^ Northeast Chapter (April 26, 2006). "2005–2006 Balchen/Post Awards". American Association of Airport Executives. Archived from the original on September 24, 2010. Retrieved June 6, 2011. ^ "Runway 28 Project". Cherry Capital Airport. Retrieved November 6, 2017. ^ "TVC Continues Runway Improvements". Traverse City Business News. Retrieved November 6, 2017. ^ "Traverse City Costco Warehouse". Costco. Retrieved November 6, 2017. ^ "America's Rip-Off Airports". Forbes. February 16, 2009. ^ "Cherry Capital Airport Adds Direct Service To Charlotte". theTicker. October 4, 2018. 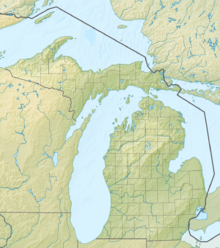 ^ "City, MI: Cherry Capital&carrier=FACTS". Transtats.bts.gov. Retrieved January 24, 2018. ^ "Village Loops : 10 - 16 : BATA". www.bata.net. Retrieved February 16, 2019. ^ "2008 Annual Report to Congress" (PDF). National Transportation Safety Board. Archived from the original (PDF) on August 14, 2009. This page was last edited on 6 April 2019, at 23:12 (UTC).